New maps of gamma-ray light streaming in from the sky reveal some surprising sources of this highest-energy form of light, including objects that were never detected before. NASA's Fermi Gamma-Ray Space Telescope, orbiting around Earth, scans the entire sky every three hours. It watches for not only continuous sources of this dangerous radiation but numerous sudden explosions, such as gamma-ray bursts in the distant universe and flares from the sun. The latest maps produced by the satellite's Large Area Telescope (LAT) identified 1,873 cosmic gamma-ray sources. Although more than half of these astronomical objects are the usual suspects — active galaxies, whose supermassive central black holes spew forth radiation as they rip apart the matter falling into them — more than a third of them were never seen in any other wavelength of light, visible or otherwise. "Several of these sources could provide big surprises, and this is something really exciting," said study co-author Gino Tosti, an astrophysicist at the University of Perugia in Italy and currently a visiting scientist at the SLAC National Accelerator Laboratory in Menlo Park, Calif.
One enigma inside the Milky Way has the cumbersome designation 2FGL J0359.5+5410. It resides in the constellation Camelopardalis, near the populous midplane of our galaxy. "2FGL J0359.5+5410 might belong to a new class of object not detected before in the gamma-ray band," Tosti told SPACE.com. Meanwhile, W44 is a 20,000-year-old object about 9,800 light-years away in the constellation Aquila. Researchers think W44 is the wreckage of a supernova, an exploded star. Fermi's observations of W44 strongly hint that gamma-rays are coming from where the supernova remnant's expanding shock wave interacts with cold, dense gas clouds – perhaps emerging from speedy protons colliding with gas atoms. Another supernova remnant source of gamma-rays is the famous Crab Nebula. Located 6,500 light-years away in the constellation Taurus, the nebula is left over from a supernova whose light reached Earth in 1054. At the heart of an expanding gas cloud around what is left of the original star's core is a pulsar spinning 30 times a second. Fermi and the Italian Space Agency's AGILE satellite have detected a number of short-lived gamma-ray flares at energies hundreds of times higher than the nebula's observed X-ray variations. The researchers suggest these "superflares" are due to electrons near the pulsar, accelerated to energies a thousand trillion times greater than that of visible light — far beyond what can be achieved by the Large Hadron Collider near Geneva, Switzerland, now the most powerful particle accelerator on Earth. In addition to supernovas and their remnants, regular novas can emit gamma-rays. V407 Cygni is a binary star system about 9,000 light-years away in the constellation Cygnus that contains a compact white dwarf and a red giant star about 500 times the size of the sun. This system occasionally flares with outbursts known as novas, when gas from the red giant collects onto the white dwarf's surface and eventually explodes. Gamma-rays from these novas defied expectations — scientists had not expected such explosions to have enough power to generate high-energy gamma rays. 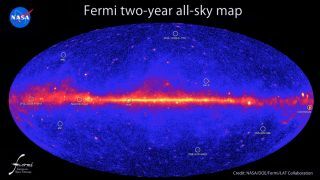 Pulsars make up about 6 percent of Fermi's new map of gamma-ray sources. Working together with radio astronomers, the Fermi team found that pulsar PSR J0101-6422 in the southern constellation of Tucana pulses with gamma-rays nearly 400 times a second, matching up with radio data. One source close to home is the Andromeda Galaxy (M31), which at a distance of 2.5 million light-years is the nearest spiral galaxy, one of similar size and structure as our own Milky Way. The gamma-rays seen from M31 are mostly caused by high-energy cosmic rays slamming into the gas between the stars. "It took two years of LAT observations to detect M31," said study coauthor Jürgen Knödlseder at the Research Institute for Astrophysics and Planetology in Toulouse, France. "We concluded that the Andromeda Galaxy has fewer cosmic rays than our own Milky Way, probably because M31 forms stars — including those that die as supernovae, which help produce cosmic rays — more slowly than our galaxy." Active galaxies called blazars constitute the single largest source class in the second Fermi LAT catalog, but nearly a third of the sources are unassociated with objects at any other wavelength. Their natures are unknown. Much farther away is PKS 0537-286 in the constellation Leo, which is more than 11.7 billion light-years away, the second most distant object Fermi's Large Area Telescope detected. The cores of active galaxies spray out jets of particles at near-light speed, and such galaxies are called blazars when these jets point our way. PKS 0537-286is a variable blazar, whose jet can vary in brightness over time by more than a hundredfold. This object is so far away, we are viewing it as it was when the universe was just 2 billion years old. "The general picture is that the variability is due to the formation of perturbations or instabilities in the jet," Tosti explained. The center of the Cigar Galaxy (M82) is bright for another reason. Located 12 million light-years away in the constellation Ursa Major, this is a so-called starburst galaxy, whose core forms 10 times more young stars than the Milky Way does. This hyperactivity guarantees a high rate of supernovas, as most of the short-lived stars come to explosive ends bright in gamma-rays. Gamma-rays are not just limited to galactic cores, as can be seen with the giant elliptical galaxy Centaurus A, also known as NGC 5128, which is located 12 million light-years away in the southern constellation Centaurus. The galaxy is bright with radio waves, emitted from million-light-year-wide lobes of gas hurled out by the supermassive black hole at the galaxy's center. Fermi detected high-energy gamma rays from these lobes as well. The radio emissions come from fast-moving particles, which can slam into photons and boost them into gamma-ray levels, researchers said. One mystery object is 2FGL J1305.0+1152, located in the constellation Virgo and high above our galaxy's midplane. Its gamma-ray spectrum — the relative amounts of different energies of gamma-rays — resembles neither a pulsar nor a blazar. Tosti did note this enigma is located in a region where gamma-ray sources are mostly active galactic nuclei, the bright centers of galaxies with hungry supermassive black holes. "Its probability to be an active galactic nucleus might be high, but not 100 percent," he said. Only with the discovery of a counterpart of this source at other wavelengths will we be able to disclose its mystery, he added. "I would say that the work is just starting," Tosti said. "We were able to detect the sources — now we have to understand better the physical mechanisms that are responsible of their emissions." Gamma-ray sources aren't the only mysteries that Fermi stands to unravel. Its observations are providing astrophysicists with hope of solving the old puzzle of the origin of cosmic rays. "Fermi and other multi-wavelength studies are providing growing evidence that supernova remnants are the source of the bulk of galactic cosmic rays," Tosti said. "However, the sample of supernova remnants observed by Fermi is still too small to declare the problem solved. I feel that this longstanding mystery will be solved soon — it would be nice if this could happen next year, when there will be the celebration of the centenary of the discovery of cosmic rays by Hess in 1912." Tosti and his colleagues detailed their findings Sept. 9 at a meeting of the American Astronomical Society's High Energy Astrophysics Division in Newport, R.I.